Notification Center on your iPhone gives you an at-a-glance, timely view of everything you want to keep on top of: new e-mails, texts, the current temperature, appointments and reminders, Tweets, and more. When you stop to think about it, a smartphone is smart because of all the things it can communicate, from stock prices to social-networking friend requests. If you provide your Facebook user credentials in Settings, you can post directly to the world’s most popular social network right from Notification Center. Similarly, if you provide your Twitter information, you can Tweet from Notification Center. Although it’s useful to keep tabs on all this stuff, you don’t want to be hit over the head with the information, thus distracting you from whatever else you’re doing on the iPhone. So Apple delivers notifications unobtrusively by displaying banners at the top of the screen that then disappear until you actively choose to view them. 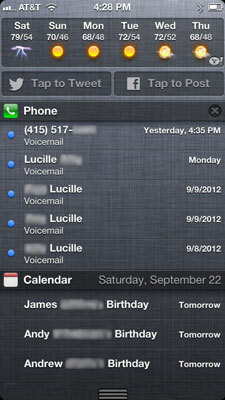 And when you want to do just that, you can summon Notification Center, just by swiping down from the top of the screen. You can also choose which notifications you will see. Tap Settings→Notifications and then tap the notifications you want to see. What’s more, you can customize the way the notifications you do want to see appear. By way of example, in Settings, tap Reminders under the list of apps and widgets that you can include in Notification Center. You can decide whether reminders should appear in Notification Center and indicate whether you want to see just a single reminder item, up to five reminders, or up to ten of these items. 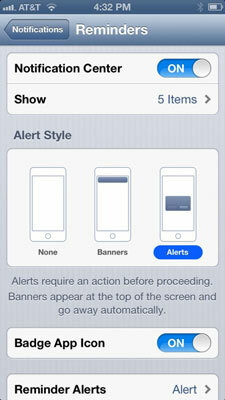 Next, choose an alerts style: whether such reminder notifications appear as a banner at the top of the screen that disappears automatically or as an alert that requires your response before you can do anything else. If you don’t want to be bothered with notifications at all, turn on the Do Not Disturb option, new in iOS 6. When enabled, alerts that would otherwise grab your attention will be silenced. You can even schedule the time that the Do Not Disturb feature is turned on. You can also turn on Do Not Disturb to silence incoming phone calls.